There has been a ton of radio silence on my blog for quite some time. I underwent several major life transitions that had to be adjusted to before I could have time and proper headspace to write. But I’m back! 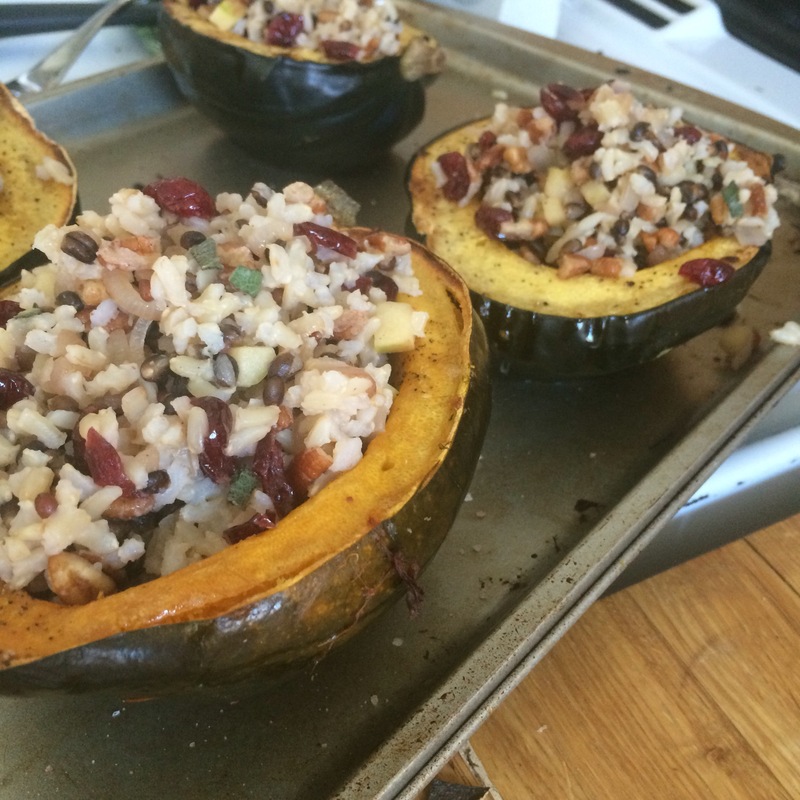 And with an arsenal of delicious fall inspired recipes, like these stuffed acorn squash. Going in theme with my healthy lifestyle, and the occasional binge on Indian takeout, I have fallen in love with autumn squash. All kinds, I’m not prejudiced. It’s just so cozy and fills you up without making you feel guilty. Let’s be honest, there’s already ample guilt during the holiday season. These little acorn squashes stuffed with a wild rice mix are a perfect winter warmer that will leave your tastebuds completely satisfied. Most healthy or even healthier dishes can really disappoint you on the flavor charts….Kind of like the Cowboys on a Sunday afternoon. But they won’t break the calorie bank for you! These little babies come in at around 400 calories a piece. Fun fact, they are also completely vegan! Preheat the oven to 450 fahrenheit. Use the first tablespoon of olive oil to coat the inside of the squash. Season with salt and pepper to taste. Arrange cut side up on a baking tray and bake for 25 minutes. While the squash are roasting start sautéing the chopped shallots in the other tablespoon of olive oil over medium heat until lightly translucent, about 3 minutes. Add in the pecans, cranberries, fresh sage and cooked rice. Continue to cook for an additional minute or two. Remove the pan from the heat. Once the squash are out of the oven, fill the each cavity equally with the hot rice mixture. Eat and enjoy! These are good to keep in the fridge for about 3 days.